Rural education wasn’t on my radar until I started to manage the Rural Opportunities Consortium of Idaho (ROCI), a joint initiative between Bellwether, Paul Hill, and the J.A. and Kathryn Albertson Family Foundation. Like many others working in education policy and reform, my attention had been focused on urban America. 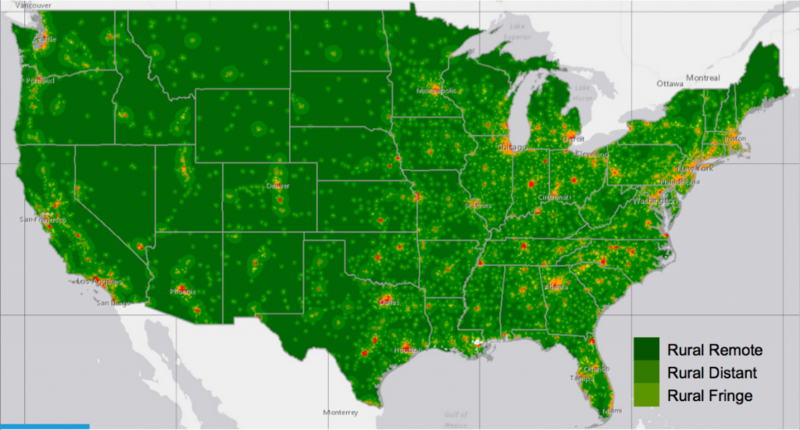 Everything in a shade of green below is rural America – 72 percent of the U.S. land area, 15 percent of the U.S. population, and 18 percent of public school students. Here are a few rural-urban comparisons that demonstrate that the challenges in rural America are real and pressing. None of this is to minimize the challenges for urban youth; it is simply meant to put rural education in a familiar context. Rural youth also have similar rates of drug abuse, though they are less likely to use cocaine and more likely to use meth; they have higher rates of teen pregnancy, and lower access to health care. Rural youth join the military at rates higher than their urban peers. Despite performing slightly better than urban students on the National Assessment of Educational Progress, just 31% of rural students go onto college compared to 46% of their urban peers. Just 17% of rural students graduate from college, compared to 32% of their urban peers. Specifically in the rural south, upward economic mobility is terribly unlikely for students born into the lowest income quartile. It’s easy and understandable to focus on the challenges that are immediately observable in our own communities – and I’d hazard a guess that most education policy analysts live in urban or metropolitan areas. But we should not forget that there are nine million rural students who need a high-quality education to reach their own potential and contribute to the economic, political, and social well being of the country. This entry was posted in Education Policy, Research, Rural Education, Uncategorized and tagged College-going, poverty, rural education on January 22, 2016 by Juliet Squire.